Rangzen Alliance » Tibetans Welcome President Hu? One of the more bizarre happenings during Hu Jintao’s visit to the US this month was a delegation of “Tibetan” dancers welcoming him in front of the White House. A friend of mine went over to this group and tried to speak to them in Tibetan but it soon became clear that they didn’t understand a word of the language. They were, in point of fact, Chinese youths who had been dressed up in gaudy versions of traditional Tibetan costumes and had been taught the kind of ersatz “folk” dances that the Chinese Communists had imposed on the performing cultures of Uighurs, Tibetans, Mongols and other so called National Minorities. It also became quickly clear that there was something official about this group as they were accompanied by a “minder” who stepped up to my friend and told him that he could not speak to any of the dancers and had to direct his questions to him. We have to ask ourselves if the Chinese actually intended to pass these dancers off to everyone, including the international media, as real Tibetans welcoming president Hu Jintao? It might sound ridiculous, but I wouldn’t put it past the Chinese to attempt such a blatant deception. Think about it. What could be more mind-bogglingly and brazenly disingenuous and hypocritical as atheist Communist leaders selecting the incarnation of the Panchen Lama, and even presiding over his enthronement ceremony in the most matter-of-fact, butter-wouldn’t-melt-in-your-mouth, fashion. 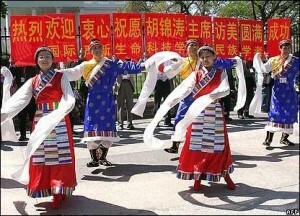 Arranging fake Tibetan dancers to welcome Hu would be a trivial thing by comparison. An Eastern European personnel from Radio Free Europe who saw the dancers was overheard remarking that even the Soviets would never have attempted this sort of thing. All exile Tibetans ought to feel grateful to those Tibetan activists who, in spite of the Kashag’s coercive “appeal” not to protest Hu’s visit, went out there and did so. If real Tibetan demonstrators had not been there at the White House, waving the Tibetan national flag and anti-Chinese banners and placards, there is a good chance that these dancers could have been considered by the Western press as actual Tibetans welcoming Hu and might even have been reported as such. I wouldn’t put it past some of the more China-adoring journalists (especially those from Rupert Murdoch’s media empire) to declare that Tibetans had now switched from demonstrating against China to welcoming its supreme leader. The photograph in question of the dancers was from Agence France Press, and appears to have been quite widely reproduced world over. There was no mention anywhere that the dancers were Chinese dressed up as Tibetans. A BBC caption just stated that the dancers were supporters welcoming the Chinese president. Besides having their own “Tibetan” contingent out to welcome President Hu, I think the Chinese were also counting on Tibetans not to demonstrate this time around, or at least for there to be a significantly smaller Tibetan contingent than usual. They would know wouldn’t they, after all, it doesn’t take any great deductive skill to see that Chinese pressure or enticement of one kind or the other was responsible for the Kashag’s “appeal” of 3 April 2006, to Tibetan activists and support groups not to demonstrate or protest so as “to create a conducive atmosphere for negotiations”. If you take the pseudo-Tibetan dancers, the Kashag appeals, and perhaps even the canceling of the 5th Tibet Support Group conference scheduled in Brussels in June 2006, besides other (invariably depressing) goings-on in the exile and support-group world, one can begin to discern a wider Chinese strategy to marginalize, perhaps even eliminate Tibetan opposition to China in the free world. We know that from around the beginning of 2000 there was actually a concerted effort in Beijing to organize such a campaign. In June 2000, China’s foreign propaganda chief Zhao Qizheng declared that in terms of external propaganda the “enemy is strong and we are weak” and called on China’s Tibetologists to take up arms on the “battlefield” of propaganda. Not only academic but various artistic and cultural delegations from Tibet have been sent around the world to spread China’s propaganda about Tibet. A 2001 TIN report called this new Chinese campaign “a strategy of engagement and attack”. At the rate this kind of convenient, self-serving, but essentially delusional thinking seems to have infected the Tibetan leadership, I can envision, a few years from now when another Chinese president visits America, the Kashag calling on Tibetans in the USA and Canada to dress our children up in their national costumes and bus them to DC to welcome the glorious leader. To all those who were out there: RTYC Minnesota, RTYC Portland, RTYC Seattle, RTYC New York/ New Jersey, SFT, ITIM and individual Tibetans and friends. Thanks.